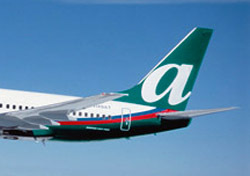 AirTran is the only airline so far to post a profit for the first quarter of 2009. The low-cost carrier pulled in a respectable $28.7 million in net profit, a stark contrast to the hundreds of millions other airlines are losing. This is the second straight quarterly profit for the airline. AirTran is also running a contest in which customers can suggest a new onboard perk for the airline to offer. Head over to everyflight.com and submit your ideas. You can also vote on other people’s suggestions, and peruse a state-by-state breakdown to see what ideas are popular in which states. Right now the list of ideas includes practical suggestions like “healthy food for sale,” “internet,” and “seat back TVs.” The list also features several ideas AirTran isn’t likely to adopt, such as “pony rides,” “dragon fighting,” and “Sarah Palin.” The winning perk will be announced May 12.